Cardio & Appetite: Does Cardio Make You Fat? Does endurance-training (cardio) increase or decrease your appetite? What about resistance training? Some might say that exercise increases appetite, while others say the opposite. The plain truth is that since exercise burns calories, you should think appetite increases to make up for those burned calories. For those who want to lose weight, that might come as a shock. What sounds logical is not always true. The media have done a great job of convincing the public that exercise increases your appetite and that you end up eating more and getting fat. I have read and looked into the latest reviews and meta-analysis, which should sum up nicely what we know to date. The research that has been done is mostly short-term. The authors of the studies admit some limitations of the studies – mainly sub-optimal study design and small sample sizes. A meta-analysis by Schubert et al, 2013, looked at acute energy intake up to a maximum of 24 hours post-exercise (1). Twenty-nine studies, consisting of 51 trials were included. Exercise duration ranged from 30 – 120 min at intensities of 36-81% VO2max. 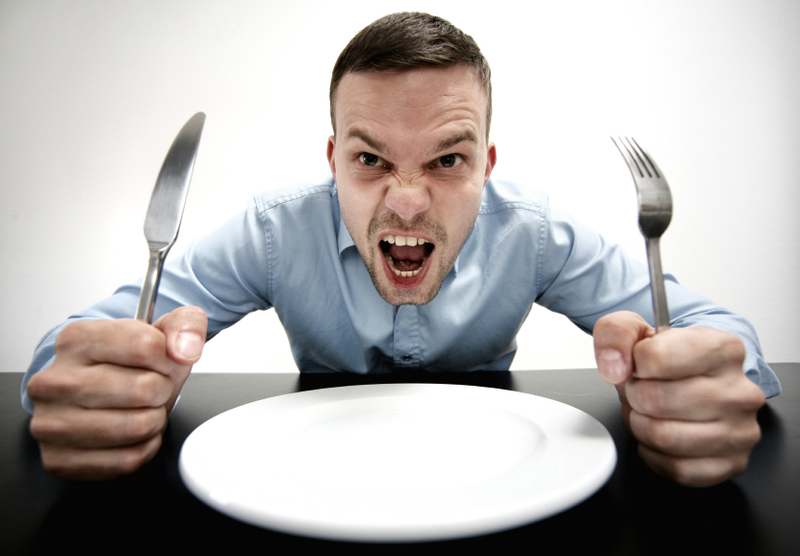 Test meals were offered 0-2 hours post-exercise. If subsequent meals were presented, they were 4-5 hours apart, from 1-4 meals. The overall results suggest that exercise is effective in producing a short-term energy deficit. Meaning that the subjects did not compensate for the energy they expended during exercise, in the 2-14 hours after exercise. Forty-five studies reported relative energy intake after exercise. They showed that participants compensated for the energy used in exercise by around 14%. All trials reported absolute energy intake. Despite large energy expenditures, the absolute energy intake was only slight higher in the exercise group compared to the no-exercise group, with a mean increase of about 50kcal. These results are in line with a review of Deighton et al 2014 (2). Namely, that an acute bout of exercise does not stimulate any compensatory increases in appetite and energy intake on the day of exercise. As for long term, only 2 out of the 36 non-randomized and randomized trials, in duration from 3 to 72 weeks, reported an increase in absolute energy intake in response to exercise. Moreover, 30 of the studies reported no change in calorie intake, while five of the randomized studied reported significant decreases of 200-500 calories per day in response to training. Blundell et al, 2015, agrees that exercise has little effect on energy intake within a single day (4). However, in the long-term, there seems to be a raise in compensatory energy intake, ranging from 0 % to 60 % compensation in energy intake for the exercise expenditure. The meta-analysis by Schubert et al, 2013, indicated that individuals of low and moderate fitness reduce energy intake more than those with high fitness level (1). They reference previous work that agrees that individual who are more physically active more accurately regulate their energy expenditure. The researchers write that active individuals compensate for about 23% of energy expended while inactive individuals actually had a negative compensation of -35,5%. In Donnelly et al’s review, they found no difference in fitness level and energy intake (3). Five interventions in Schubert et al’s meta-analysis utilized resistance training (1). The sessions were between 35-90min with 10-12 repetition maximum and 2-4 sets. Acute energy intake up to 14 hours were reduced compared to energy expenditure; however, it was not as reduced as the groups with endurance training. Worth noting is that energy expenditure of resistance training is difficult to quantify precisely. So don’t stop doing resistance training, there are a lot of other positive advantages, like improved body composition. In addition, the review by Donnelly et al found no difference between energy intake post-exercise in endurance exercise and resistance training (3). An effect of exercise intensity was not found in Schubert et at’s meta-analysis (1). However, the researchers mention in the text that others have found that intensities above 70% VO2max appears to reduce appetite but with minor changes in absolute energy intake. In contrast to this finding, Donnelly’s review found no significant difference in exercise intensity and duration on energy intake (3). Deighton et al also concludes that high-intensity does not reduce appetite more than low-intensity (2). However, if you look more into the studies analyzed in Donnelly’s review you will see that high-intensity might have some advantages concerning reducing energy intake. The mean (average) in Schubert et al’s meta-analysis showed a short-term reduction in energy intake (1). However, some actually increased their absolute energy intake post-exercise. Some of the trials in Donnelly et al’s review also increased their energy intake, meaning that some compensate more after the energy deficit the exercise gives (3). Compensators have showed an increase in hedonic response to food, which means they are more sensitive and “weak” to food that give more pleasure eating. How does exercise influence appetite? As stated in the start of this article – since you burn calories through exercise you should expect to increase appetite and make up for it with eating more. As the research says, in most people it does not. The reason might be because exercise suppresses ghrelin levels (a hormone that stimulates energy intake), while increasing hormones that increase satiety, such as peptide YY (PYY) and glucagon-like-peptide 1 (GLP-1) (1). 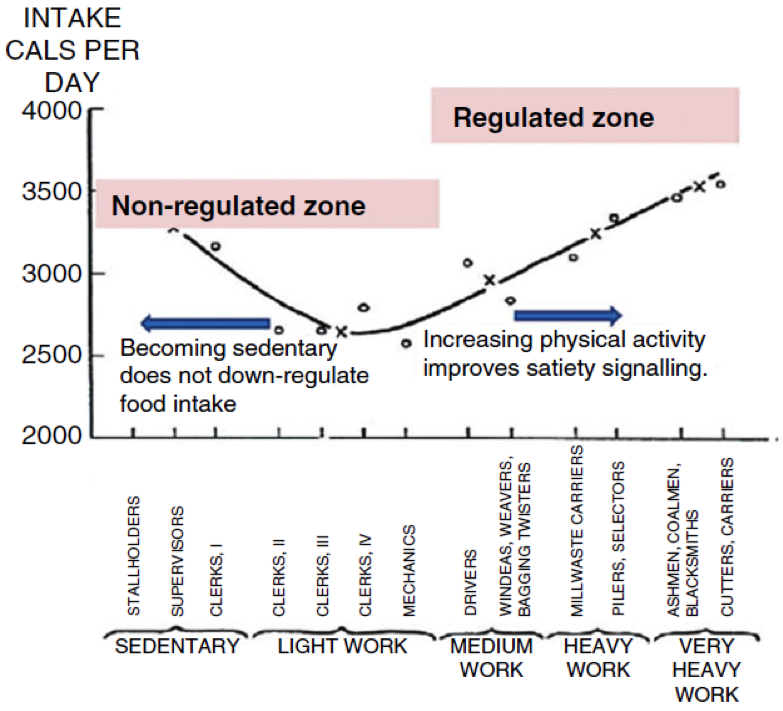 This is in line with data from Blundell et al, 2015, which means that increased physical activity improves satiety signaling and appetite control. And that this system gets deregulated in sedentary people, thereby permitting overconsumption, as shown in the illustration (4). Exercise does also make adjustments other than with gastrointestinal hormone response and gastric emptying: blood flow, muscle cellular metabolism, adipose tissue biochemistry as well as brain activity gets adjusted by exercise. Why do individuals lose less weight than would be expected during long-term exercise interventions? Several theories exist regarding why individuals do not lose as much weight as expected during an exercise program (1). The bottom line is, on average, exercise will not make you eat more. Moreover, exercise is a tool you can use for losing weight. Energy expenditure of exercise is the strongest predictor of fat loss during an exercise program, according to Deighton et al (2). 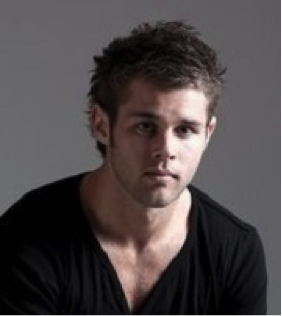 Fredrik Tonstad Vårvik is a personal trainer & nutritionist. He writes articles and work with online coaching at fredfitology. Follow him and his colleagues at facebook & twitter. Check out FredFitology for more info.